We are very happy to announce Harvest Co-Op has ordered life, Life by Chocolate, that is. I just love this co-op. I stopped there when I was in Cambridge and had some of their great food at the cafe and deli. Very nice. I was giving out great chocolates while I was there and had an espresso and a muffin. I discussed life, music and science with some of the MIT and Harvard students who work there. The staff is wonderful and helpful. I have no photos because I was there some time ago. but Harvest Co-Op in Cambridge is a substantial co-op with wonderful food and products. I used to live in Cambridge when I was a visiting professor at Harvard. It's a beautiful city and it looks like Kim and I are going to have to go back so that we can take pictures of this fantastic co-op. Welcome Harvest Co-Op to Life by Chocolate. The only type of life. Please buy your chocolates, especially Life by Chocolate, at the Harvest Co-Op in Cambridge. My talented younger brother John had a birthday party. 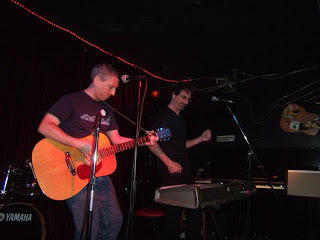 He decided to play at the Side Walk bar in Alphabet City in Manhattan for his birthday. And what a party it was. He did a retrospective of his life musically. That is, a retrospective of his music and his life. Life by Music. Duet with Frank. An old childhood friend. 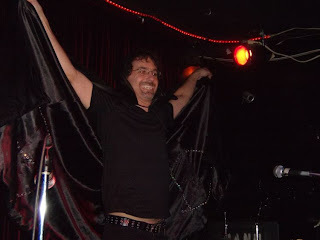 Soy Dracula making a guest appearance. 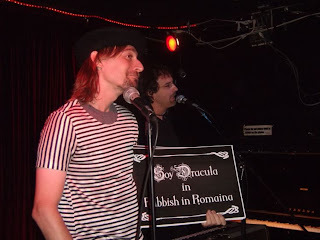 Count Cory and Soy Dracula doing Rubbish in Romania. John and his lovely lady Carla. Kim had to stay home. Sigh. Always working. It's tough for both of us to leave, especially during workshop season. However, many friends and family did show up. 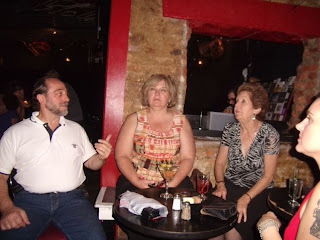 Carla's Aunt, Nephew and her Mom. 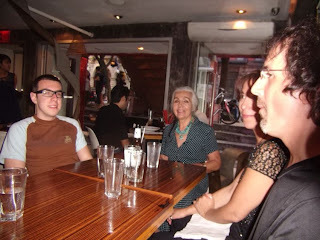 Brother-in-law, sister, and our Mom. 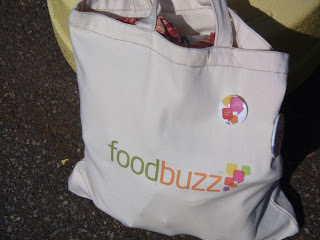 Of course, I had to go and eat at Lupa and bring my fab foodbuzz bag. I actually used it for an overnight bag. And by this sign, they recognized me! I struck something, something, something, something into the hearts of the staff at Lupa. 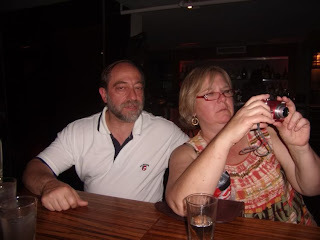 Who is that mysterious foodbuzz reviewer? Buzz on the move. Read all about it in my Lupa Post.